Dada Engineering Ltd. has commenced its successful journey in 2003 with a commitment to make complete solution of engineering endeavors. From the very beginning it is well equipped with state- of the –art machinery and run by expert and skilled management. Dada Engineering Ltd. is producing high quality Spun pre-stressed Concrete (SPC) poles. Railway Slippers, Bricks & Pavers and Decorative Light Poles. Designs of all products are approved and tested by Bureau of Research. Testing and Consultation (BRTC) of BUET (Bangladesh University of Engineering and Technology Dhaka, Bangladesh and QC is passed before being labeled as finished products. Basically it attaches high importance to quality control and production of durable products. We have introduced the best technology in Bangladesh through collaborations with Chinese company. Our core business philosophy revolves around persistent endeavors in improvement of our existing enterprises, constant quest in diversification and focus on quality management. We are grateful to all our clients, stakeholders, partners, suppliers and associates within and outside Bangladesh, who have supported us in different ways to establish a firm footing in industrial sector of Bangladesh. We aspire to grow in order to contribute towards making a prosperous Bangladesh. Our products have been supplying to Government electricity utility organization in Bangladesh such as, Bangladesh Rural Electrification Board, Bangladesh power Development Board, Dhaka Electric Supply Company, Barind Multipurpose Development Authority etc. since 2003 or 2007. We have supplied about 730,000 pcs of SPC poles (sizes from 7.60 m to 18.3 m) as on September’ 2018. Dada Engineering Limited is located about 70km north of the Capital City Dhaka at joina Bazar under Gazipur District. 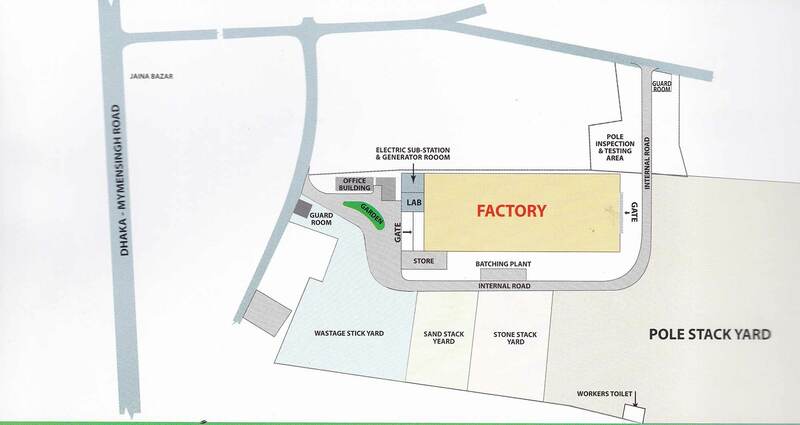 The factory has two units which are situated over 10 acre of premium land, beside Dhaka-Mymensings Highway. All facilities like water, gas and electricity have been developed to support manufacturing of high quality products. The communication facility in the area allows purchaser/consumers to make easy transportation of goods and material to their desired place.